I just wanted to say how much I enjoyed your book given to me by my oldest friend Di Caudery. We met on the green at East Prawle about 56 years ago and are still in touch. My parents Alf and Elsie Burton honeymooned in Batson during the war. They discovered Prawle and decided to rent a holiday cottage: Corner Cottage. It was owned by Phyllis Putt. The cottage was cosy but had an outside toilet and no bathroom so as children we all washed in the kitchen sink overlooking the bus shelter on the Green.I was friendly with Bubby and Sandra Mitchelmore but we all soon formed a large gang and were notorious in the village. 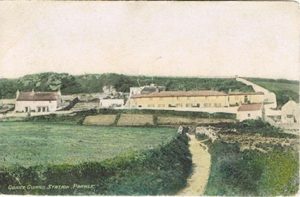 In those days holiday cottages were rare and the village w as inhabited by locals. Members of our ‘gang’ came and went. Among them were Martin Ford, Elaine Easterbrook, Rosalind Putt, Anthony Tabb (always at a distance), his cousin Timmy, Gregory and Chris Wotton and David Farleigh. Later we were joined by Martin’s cousin Mark, Raymond and Will Pack. I am sure there were more. We had wonderful holidays racing down to the beach as soon as the sandbank was exposed after purchasing fruit pies in packets from the shop on the green which later became the pottery. We hindered the Tucker boys as they tried to harvest, often cadging a lift back to the village in the corn cart. In those days your house was the barn; infamous for its goings on! The Tucker boys would dry the corn in the barn and we would get in their way by leaping from the large barn window down onto the sacks. They rigged a swing for us and we spent hours playing, with the transistor on full blast; Radio Luxembourg and Horace Batchelor in those days. We would be up with the lark and home as late as possible. We were allowed to roam far and wide and got up to all sorts of mischief. I am sure there is a tree in the woods by the old farm gate on the path to Horsley with our names carved. We would borrow bikes from the villagers and cycle to Portlemouth to catch the ferry over to Salcombe. Martin Ford’s had a fixed wheel and I remember him flying over the handlebars. Fortunately he was unhurt. The days were free and easy full of excitement and adventure just like the Famous Five books. I don’t think the village has ever seen the likes of it again. I remember Granny and Grandpa Putt. Their granddaughter Rosemary was great friends with my much younger sister Debbie. The Pigs Nose was owned by Larry in those days with the Piglet stores. He was very kind to our gang and we were allowed bags of Smiths crisps with the salt in a blue twist and drinks. We would also be allowed to play darts. The Featherstonehaughs had the Provi. I remember Mr. Featherstonehaugh but not Mrs. There were three children Sean, Siobhan and I think the youngest was Tim. Sean went onto Hornsey Art College and was a major player in the student unrest of ’69 I think. I remember the large jars of pickled eggs on the bar counter. In those days there were two bars one on the right and one on the left. After Corner Cottage we rented Stovers Way then onto Seaview . Sharpers had not been built then and the land was used to house donkeys. I remember the Leonard sisters and the professor. Sadly he was killed in a plane crash. He was always walking the cliffs with his Dalmatian and was a lovely nut brown colour. Mrs Putt lived in the cottages with her parrot and I think next to her was Mrs Webbs Perkiss, a lovely old lady who used to feed the cats. Derek and Phyllis were at the end. Seaview as we called the row of cottages was a world unto itself. 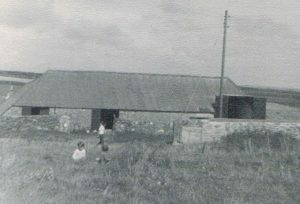 The old cottage along from us was later purchased by the Brazil family. After Molly and Jane Tucker sold Seaview we moved to the newly built Sharpers owned by Sally and we spent many happy Christmases there. I believe one of the Shadbolt girls now owns it. Life in those days was very free and easy, a far cry from the mobile phones, i pads and screens of today’s youth! We all grew up , some of us married, others moved away but until about nine years ago I still visited Prawle taking my mother to stay with my sister and her family at Seaview for a few days. My sister still holidays there every year and I believe in October she is renting Sharpers again. Cornwall is my love now and we have a lovely home there but I always remember Prawle with great affection.